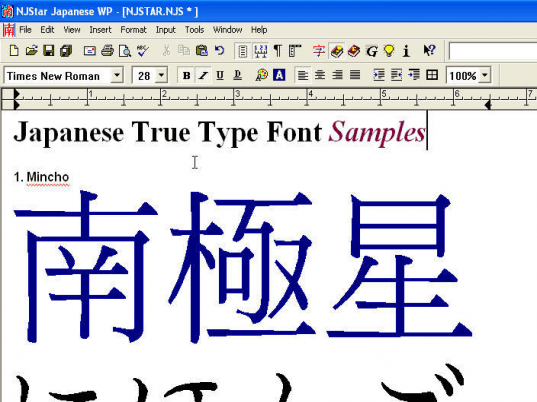 NJStar Japanese WP Version 6.0 is a major new release with all modules based on Unicode. This version supports Windows XP SP3, Vista, 7, 8 and 8.1, Windows Server 2003, 2008 and 2012. * Animate and practice Stroke order, insert/print Stroke order sequences. * Built-in 220,000-entry Japanese Multilingual (English/French/German etc...) dictionary for easy lookup. * Popup dictionary with annotations for main window text and inputbar input candidates. * Use Kanji of the day as flashcards to review vocabularies at different levels. * Find out the readings and meanings of uncommonly used Kanji characters using Radical Lookup. * Sort Japanese text based on Kana, Radical or number of Strokes. * List and count the unique Kanji used in the document and sort the list in order. * Compare two documents to highlight the difference in colors, useful for marking student's work. * Read from and Save to Microsoft RTF and DOCX Office file formats. * Ability to open a new document with different pre-defined styles and templates. * NJStar comes with 10 built-in Japanese Input Methods to suit all needs. * Track, accept, reject or hide document changes. * New Format Painter, Color Marker, Stylesheet, Inline, in frame and background picture. * Ability to adjust spacing between characters, lines and paragraphs. * Spelling check with English, French, German, Italian, etc..
* Backward compatible with NJStar WP version 4 and 5 file formats. * Additional fonts for Pro and Ultimate editions, up to 20 NJStar OpenType Japanese fonts. * Tab based multi-theme, multi-document, Customizable user interface. * Multilingual User Interface with English, French and Japanese. * Built-in automatic update checker.